Ever play a board game in the dark? The 1980s kids game from Germany called Waldschattenspiel was designed for night-time playing. It featured an open-flame candle moving around a 3-dimensional board, while other players tried to hide in the shadows. 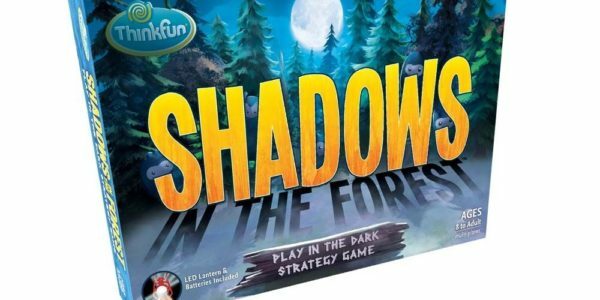 Thinkfun’s recent remake, Shadows in the Forest, officially brings the game to the US with a richer theme and a more kid-friendly LED lantern. Shadows in the Forest is an unusual and unique board game where players must tactically remain in darkness, while giggling at avoiding the dreaded light. Shadows in the Forest can technically support any number of players, with one player playing as the lantern-controlling Seeker, and everyone else playing as the Shadowlings on a team. Every round the Seeker rolls a dice and move the lantern that number of spaces through different routes on the board. The Shadowlings aren’t beholden to any such movement restrictions – but they have to remain in the shadows. A number of cardboard trees and rocks have to be assembled each time you open the box. They provide proper hiding places for the Shadowlings. If all the Shadowlings can reach one Hiding Place together, those players win. At the same time, the Seeker player is trying to bathe each one in light. Hitting a Shadowling freezes it, and the Shadowling loses its little plastic mask, unable to move until another Shadowling can safely reach it. The Seekers job is to collect all the masks and freeze all the Shadowlings. It’s basically an elaborate game of freeze tag. Despite the simplicity it’s a lot of fun, causing a raucous amount of laughing and giggling, even with adults. Playing with lights and shadows is a novel concept, and easy enough that anyone can jump in and play within seconds. The original Waldschattenspiel featured dwarves. Shadows in the Forest re-themes the figures, replacing them with cute shadowy blobs called Shadowlings. With their masks on they look like something from a Miyazaki film. They’re all plastic, including the removable white masks, but high quality. As a nice touch the dice is glow in the dark and rechargeable if you stick it next to a light source. The LED lantern does the job perfectly without worrying about your kids literally playing with fire. The game comes with six Shadowlings, and it’s up to the players how many they want to play with. It’s a nice way to create a range of difficulty challenges, with three being the easiest and six being very difficult. Darkness isn’t just a feature, it’s pretty much a requirement, and the darker the better. Playing in an dimly lit area or not-yet dark time of day is less than ideal, resulting in arguments over whether nor not a Shadowling passed through the light. The board isn’t large but it can be tricky to see exactly where the light ends and the shadows begin at the edge of the lantern’s light. The box recommends Ages 8+ though younger kids can quickly grasp the simple rules and join in, particularly as the Seeker. By using light and shadows as a fun form of freeze tag, Shadows in the Forest is both simplistic and clever. As a rules-lite game with no firm timer it feels casual and light-hearted, though this can cause problems among kids as Shadowling movement mostly requires the honor system to stay in shadow. The game is uniquely limited by its surroundings; perfect for sleep-overs and basements, and provides a fun experience that’s guaranteed to be different than any family game you’ve played before. Shadows in the Forest is available at Amazon now, and in Target stores in August.